photo taking and playback are on the mirror itself which is touch sensitive. Several different viewing modes including front, rear, split, and PiP. The interface is easy to navigate and set the multi-function menu. no need to turn around and easy to park with the help of guidelines. G-sensor will auto-lock the recorded video when collision detected in the event off an accident it's all there for your insurance company. Parking monitor and motion detection in case your vehicle gets hit while parked. ★Note:★ Please don't turn on motion detection when driving and dash cam is recording, otherwise the dash cam will just record 10 seconds at a time and stop recording. 【7 Inch IPS Touch Screen & 1080P FHD Recording】 Simultaneous recording in Full HD 1080P front view video recording and 480P waterproof rear cam, ensuring you get the best footage all day and night. 7 Inch IPS touch screen provides a wide visual angle which makes it clearer to view video laterally. 【Reversing Camera Kit for Safe Parking】Connect the red wire from the rear camera to power positive wire of back up light, the image of rear camera with 4pcs night vision lights will automatically switch over the full view and trigger guide line for safe parking when the reverse gear engaged. 【Parking Monitor & G-Sensor】Triggered by the Parking Monitor, the dash cam front and rear will automatically turn itself on and record when parking. The integrated G-sensor will auto-lock recorded video for safekeeping when detecting collision. 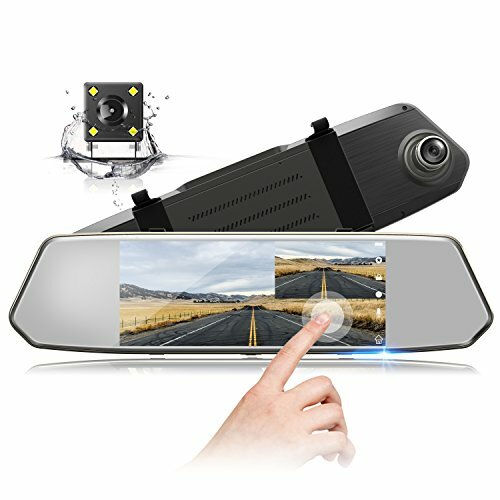 Equipped with these powerful functions, 7 inch dash cam front and rear provides powerful evidence in case of dispute and give you peace of mind when driving. ★Note:★Please don't turn on motion detection when driving and dash cam is recording. 【One-Key Switching Design】Based on one-key switching design, it is convenient for you to switch the five view modes from full screen display of front/rear view or picture-picture display. Turning off the screen display, it can be used as a regular rear view mirror. 【Exquisite Appearance and Easy to Use】With 2.5D advanced Anti-glare glass mirror, this iron body gives you a special sense of touch and vision. 7 inch sensitive touch screen is more concise and easier to set up than traditional physical buttons. If you have any questions about this product by TOGUARD, contact us by completing and submitting the form below. If you are looking for a specif part number, please include it with your message.